Carter Family Comics: Don't Forget This Blog! : Sara Sings "Single Girl": Celebrating the 85th Birthday of The Big Bang Of Country Music! 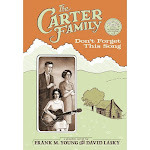 The Carter Family Live in Concert! Sara Sings "Single Girl": Celebrating the 85th Birthday of The Big Bang Of Country Music! To David and I, one of the great moments in Don't Forget This Song is when Sara and Maybelle record "Single Girl, Married Girl" on the second day of their very first recording session. This took place at the epochal "Bristol Sessions," which is seen by many country music scholars as "the Big Bang" of country music. An entire chapter in our book is devoted to the Bristol Sessions, which also introduced the extraordinary Jimmie Rodgers to the musical world. Above is Sara and Maybelle's exquisite 1927 original of "Single Girl, Married Girl." Take a few minutes and savor one of the finest performances in Sara Carter's career--she struck gold in her first recording session.